Depart after an early breakfast for the Mountain Gorilla Sanctuary of Bwindi arriving in time for lunch at the tracking base. In the afternoon, take a self guided walk around the camp along the Munyaga River before returning for sunset views across the Bwindi Forest. Dinner and overnight at Gorilla Forest Camp. After breakfast, travel to the base of the mountain for a briefing before starting the gorilla trek -30 minutes to 8 hours trekking. After picnic lunches and drinks in the Bwindi Impenetrable, we return to base for dinner and overnight at Gorilla Forest Camp. It is amazing what an volcanic explosion can create, Lake Bunyonyi was birthed by a volcanic explosion. Today it is one of the deepest lakes in Africa, from 44 meters to 900 meters in depth. The Bunyonyi environs are uniquely endowed with the resident African Harrier Hawk, Yellow-backed, spectacled weavers, Levillant, etc. The name in the local language is "the place of little birds" and there are many that you will find here, the beauty that these volcanic explosions created many years ago is breathtaking. Surrounded by mountains in what is called "the little Switzerland." Terraced hills where people till the soil and grow food. The climate is perfect, the temperature of the lake a pleasant 25 degrees, perfect for swimming and bilharzias free. After breakfast, depart for Kampala for lunch at the Gallery Cafe before proceeding to the airport for a late evening flight to Nairobi. On arriving Nairobi, met and transferred to Nairobi Safari Club for overnight, BB. Day 6: Nairobi - Samburu Game Reserve. Leaving Nairobi we head north via the shoulder of Africa's second largest mountain, Mount Kenya, making our way to the Samburu Game Reserve and We camp beside the Ewaso Nyiro River under shady palms and woodlands. The camp has refreshing cold showers to freshen-up in and escape the heat of the African plains. Full day’s game viewing in Samburu Reserve, exploring its open grasslands and diverse landscapes in search of the variety of wildlife found here. Samburu hosts beautiful forests, springs and rivers, offering stunning scenery. The game park is part of a lava plain that includes varied habitats, from thorn scrub, red dirt and dried river beds, to broken volcanic rock, steep hills and rocky outcrops. This region of Kenya is home to the uncommon Grevy's zebra with huge fury ears, gerenuk antelope standing on hind legs to feed, Somali ostriches with distinct blue legs and the shy Oryx. Elephant and crocodile are guaranteed sightings and lion, hippo and giraffe are also found in the reserve. The bird watching is excellent, with over 365 species, including numerous varieties of weaverbirds and the martial eagle. Leopard sightings are also a special feature here. The Samburu area is also home to interesting people with a rich heritage, making for a colourful cultural experience.. Depart Samburu after breakfast and drive to Aberdare National Park arriving Aberdare Country Club in time for lunch. Afternoon transfer to The Ark for overnight floodlit game viewing. Set in the heart of the Aberdare National Park, this unique game lodge overlooks a floodlit waterhole and salt lick which attracts a host of wildlife – elephant, rhino, leopard, bushbuck and occasionally an elusive bongo or giant forest hog. Dinner and overnight at the tree tops lodge. Please note: Only overnight bags are allowed at The Ark, with the rest of your luggage being left behind at the base hotel. The Aberdare National Park, with an area of 767 Km2 covers the higher areas of the Aberdare Mountain Ranges of Central Kenya, from altitude of 1829M to 4001M above sea level. The topography is quite diverse with deep ravines that cut through the forested eastern and western slopes. Animals easily observed in the park include; the Black Rhino, leopard, baboon, black and white Colobus monkey and sykes monkey. Rarer sightings include those of lions, the golden cat and the bongo- an elusive forest antelope that lives in the bamboo forest. Animals like the eland and spotted and melanistic serval cats can be found higher up in the moorlands. Visitors can also indulge in picnics, trout fishing in the rivers and camping in the moorlands. Bird viewing is rewarding, with over 250 species of birds in the park, including the Jackson's Francolin, sparry hawk, goshawks, eagles, sunbirds and plovers. Morning drive back to Aberdare Country Club, then depart shortly to the floor of The Rift Valley making a brief stop at Nyahururu Thomson Falls. Arrive hotel in time for lunch, followed by an afternoon game drive. 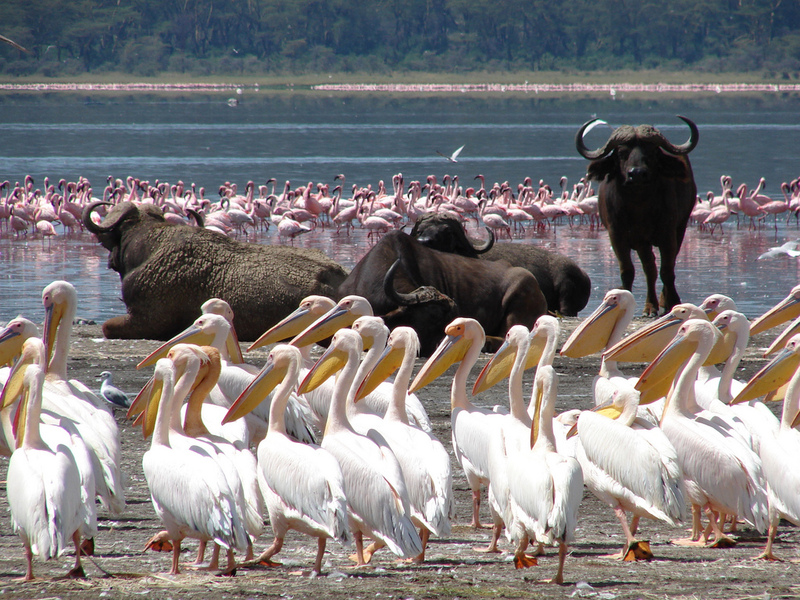 Besides the flamingos that the lake is famous for, there are approx 400 other species of birds visiting the lake. Also, many species of game can be found in the park including the introduced Rothschild’s giraffe, black and white rhino, waterbuck, reedbuck, lion, buffalo, leopard, baboon and many species of plains game. Dinner and overnight at hotel. Depart Lake Nakuru after breakfast and drive further along the floor of the Rift Valley to Maasai Mara arriving the budget camp in time for lunch. Afternoon game drive. Dinner and overnight at the lodge / camp. 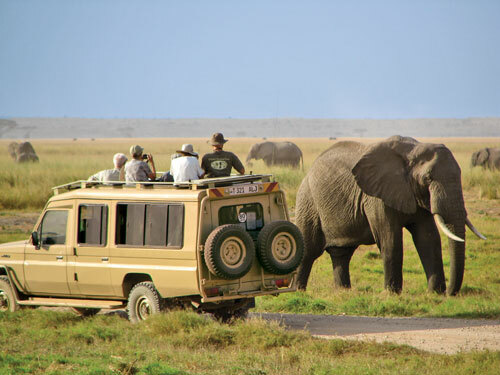 Spend two days in Maasai Mara, Kenya’s most popular game sanctuary where you will have the best opportunity of spotting the Big Five (lion, leopard, buffalo, rhino and elephant).On one day you will go out with picnic lunch boxes to spend most of the day in the park coming back to the lodge late afternoon, while on the second day you will have an early morning pre-breakfast game drive, and another one late afternoon. There will also be an optional visit to a local Maasai village. All meals and overnight at Mara Sopa Lodge/ camp. Depart Nairobi after breakfast for Amboseli National Park arriving Amboseli camp in time for lunch. .The Park is famous for its big game and great scenic beauty whose entire landscape is dominated by Mt Kilimanjaro. Afternoon game drive. Dinner and overnight at the camp/lodge. Early morning pre-breakfast game drive when you have the best chance to see the majestic Mt. Kilimanjaro, returning to camp for late breakfast. Morning at leisure – afternoon game drive. All meals and overnight at campsite/lodge. Lake Manyara's game includes good numbers of elephant, buffalo and wildebeest along with plenty of giraffe. Also prolific in number are zebra, waterbuck, warthog and impala. You may need to search a little harder for the small and relatively shy Kirk's dik-dik, and klipspringer on the slopes of the escarpment. The broken forests and escarpment make it good country for leopard, whilst Manyara's healthy lion population are famous for their tree-climbing antics. (Whilst unusual, this isn't as unique to the park as is often claimed.) Immediately obvious to most visitors are the huge troops of baboons – which often number several hundred and are widely regarded as Africa's largest. As with the habitats, the birdlife here is exceptionally varied. In the middle of the lake you'll often see flocks of pelicans and the pink-shading of distant flamingos, whilst the margins and floodplains feed innumerable herons, egrets, stilts, stalks, spoonbills and other waders. With so much water around, the woodlands are equally productive, but it's the evergreen forests where you'll spot some more entertaining species such as the noisy silvery-cheeked hornbills, crowned eagles and crested guinea fowl. Set beneath the spectacular backdrop of the Great Rift Valley's steep western escarpment, this long, narrow park protects an area between the escarpment and Lake Manyara. The parks namesake is a shallow, alkaline lake which expands and contracts with the seasons within a long, silvery bowl of salt deposits. Adjacent to it are wide, grassy floodplains and, further away, bands of mixed acacia woodlands. Further still, next to the escarpment, are patches of enchanting evergreen forests, which are sustained by perennial groundwater springs issuing from the base of the escarpment. Full day in Serengeti. Morning and afternoon game drives in the rolling grasslands studded with wildlife for as far as the eye can see. All meals and overnight at Serengeti campsite/lodge. The Serengeti National park wildlife is the oldest park in Tanzania covering an area of over 14,760 square kilometers and borders the Masai Mara National Reserve of Kenya. The name Serengeti is a Maasai word meaning endless plains and true to this the park consists of open plains without trees stretching as far as the eyes can see. This is the most famous park in the country and the region at large as thousands of tourist visit to see the amazing wildebeest migration, as they cross the Mara River from Kenya. The Serengeti National park is a natural home for different animal species from the famous wildebeest to predator lions, the wide plains are the best grassing fields for pasture animals. The park has beautiful sun set as there are a few obstructions to the view they say its picture perfect. The most spectacular event that happens at the park is the wildebeest migration where visitors get to see thousands of wildebeest and zebras cross the Mara River in search for pasture but some fall prey to predator crocodile that inhabit this river. The occurrence has been termed as a wonder of the world as there is no human influence to this crossing. You are guaranteed to see large concentrations of game on any Ngorongoro safari. The mineral-rich floor of this spectacular bowl is largely flat, open and covered in nutritious grasses – much to the liking of large herds of zebra and wildebeest, which graze here. These extensive open plains are also home to herds of buffalo, Thomson's gazelle, Grant's gazelle and tsessebe (often called topi). You'll also find East Africa's best population of black rhino here, which are often seen in open grasslands. Breeding herds of elephant pass through the Ngorongoro Crater itself only rarely, but you will see a scattering of old bulls, including some of the biggest tuskers left alive in Africa today. The only surprising absentees from the Crater are Impala and Giraffe; it is thought that this is perhaps because of the lack of open woodlands and browsing species of trees which these two tend to thrive on. Only 90 minutes’ drive from the Ngorongoro Crater, Empakai Crater is much smaller, yet endearing in its own way. A deep soda lake covers about half of the 6km wide caldera. You'll often find thousands of flamingos in the shallows of the emerald lake - giving it a spectacular pink tinge. You can drive up to the outer rims of the crater, before taking the 45-minute walk down the path through the forested slopes to the crater floor. The views from the rim over the crater to Ol Doinyo Lengai are thought to be some of the most spectacular in Africa – on very clear days you can even see Kilimanjaro and Lake Natron. Empakai Crater is a great day trip to consider for those spending more than two nights in the Ngorongoro area. Ask us for more details. The Ngorongoro Conservation Area does not only generate interest purely based on wildlife, the area has also got arguably the most extensive history of any place on earth. It has been proved that various Hominid species have lived there for millions of years. This has been discovered because of fossils preserved in volcanic rock, which date back to 3.6 million years ago. The 30 mile long Olduvai Gorge is a steep-sided ravine in the Great Rift Valley. This is one of the most important prehistoric sites in the world and has been instrumental in understanding human evolution. This is well documented in the museum, which has replicas of some of the hominid fossils unearthed at the site, as well as the Laetoli footprints (the most ancient footprints ever found). It also has genuine fossils of some of the extinct animals that used to live in the area. We can arrange day trips to the Gorge and the museum, which is an interesting addition to an Ngorongoro safari. After breakfast descend down to the crater floor for ½ day crater tour, returning to Ngorongoro camp for lunch. Afternoon at leisure with optional visit to a local Maasai village. Dinner and overnight at the campsite/ lodge. Pls note: Only ½ day tours may be allowed at the crater. Depart Ngorongoro after breakfast and drive to Tarangire Nat. Park arriving Tarangire campsite in time for lunch. Afternoon game drive. Dinner and overnight at the camp/ lodge. Tarangire National Park covers an undulating area of 2,600km², between the plains of the Maasai Steppe to the south-east, and the lakes of the Great Rift Valley to the north and west. The northern part of Tarangire is dominated by the perennial Tarangire River, which flows through increasingly incised ravines until it leaves the north-western corner of the park to flow into Lake Burungi. In the south are a series of vast 'swamps' which dry into verdant plains during the dry season. The park's most obvious features are the permanent Tarangire River, which runs the length of it, and the vast 'swamps' – which are, in fact, dry for most of the year. Despite the fact that Tarangire is drier than the Serengeti, its vegetation is generally much denser including densely packed elephant grass, large areas of mixed acacia woodlands and some lovely ribbons of riverine forest. Think of Tarangire as part of a much larger ecosystem, and you'll understand why its game varies with the seasons. From November to May, much of the game leaves the park; herds of wildebeest and zebra head north-west onto the floor of the Rift Valley, whilst many animals disperse across the vast open areas of the Maasai Steppe. From around June to October, it's dry and the game returns to Tarangire swamps, and especially, its river system. This is the best season for a game-viewing safari in Tarangire, which can be excellent. Lion are common throughout Tarangire, as are leopard, whilst cheetah seems to favor the more open areas of the south. Spotted hyena is always around, and whilst wild dog do sometimes pass through; sightings of them are rare. With a range of environments and good game, Tarangire birdlife is also varied – and over 500 species have been recorded here, including ashy starlings and large flocks of beautiful yellow-collared lovebirds, both of which are endemic to Tanzania. Depart after breakfast with a game drive en route and return to Arusha. Lunch will be at Hotel then board afternoon shuttle bus back to Nairobi arriving approx. 18:30hrs. Drop at the airport for onward flight back home.